How was the response to Technology Offensive at Weinig inTech? Wolfgang Pöschl: The presentation of Technology Offensive at Weinig InTech started with international press with more than forty different members of the worldwide press on our inTech. And we are very proud as we had many visitors in our company- more than 1550 customers from all over the world. With Technology Offensive as your motto for LIGNA, what are your expectations from the show? 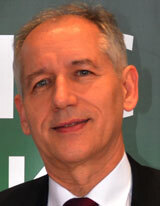 Wolfgang Pöschl : LIGNA 2015 is important for us since we always focus our developments for the LIGNA. Every second year we come up with new products and new applications. We focus on the LIGNA this time on automation, on efficiency increase for the products and therefore, also for our customers. What are the main features of new Weinig sytem plus? How would it benefit the users? Wolfgang Pöschl : The system plus is something where we are going integrate our machines into a complete plant. The overall control system should handle the whole process. We are not looking only for mass production but also for one single piece production for smaller companies. What was the need for the new Weinig user interface? Wolfgang Pöschl : The new Weinig interface was needed since Weinig has more than 40 companies in more than six production plants where we have different control systems. We are going to standardize the processing, we are going to standardize the control system and the surface in order to give our customers a uniform set up and it makes much easier for the operators to handle the complete plants. Tell us about your presence in the American market. Wolfgang Pöschl : Weinig historically has the biggest exports in the US and so Weinig has a high install base in the US. There are two very big influences that is impacting our business, the first one is the reduced numbers of second hand machines in the market and secondly the new house building in the American market in the last months which shows that the market is coming back. US is recovering continuously. Thecondition is Canada is someway similar as well.South America is picking up as well. Actually our customers are dedicated suppliers for the North American market. Are you planning on to expand any new product or have you recognized any new demand from the industry? Wolfgang Pöschl :What we see is that there is a high move – a high capacity in the engineered wood processing. Clearly we have a defined quality under wood which does not depend on the raw material too much. By combining the wood in different structure, so we are bringing all our technologies like cross cutting, scanning, gluing, moulding, finger jointing- all these processes together to optimize the wood process into engineered wood material.